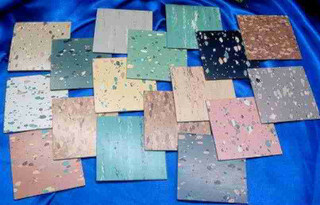 Floor tile is a small segment of the flooring industry these days. Unlike back in the 50's and 60's where everybody put tile down in their kitchens, laundry rooms, bathrooms and basements most people these days will install wood flooring, ceramic tile, vinyl sheet flooring or even carpet depending upon the application. Back in the day, vinyl tile was used extensively. It came in a different sizes such as: 6"x6", 9"x9" and 12"x12" tiles. 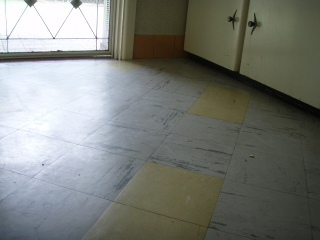 Very common back then were the 9"x9" tiles and were probably vinyl asbestos. If your home was built before 1980 and has the original floor tiles down in any room of the house then they probably contain asbestos. Especially if they were the 9"x9" variety. 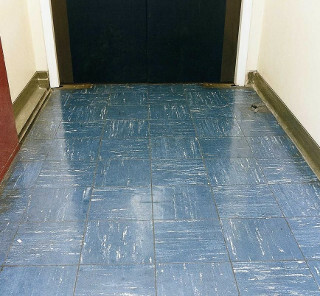 Most manufacturers stopped making vinyl asbestos tiles in 1978 but some continued until probably 1980. Even after that there was a lot of vinyl asbestos tile floating around in stores back rooms until the stock was finally exhausted. Vinyl asbestos tile is not inherently dangerous. The asbestos was encapsulated into the vinyl tile itself. It cannot be released into the air (where it becomes a health risk when breathed in) unless something causes it to be released. Anything that can abrasively wear the surface of the vinyl asbestos tile can potentially release the harmful asbestos particles into the air. Normal wear and tear shouldn't be a problem. 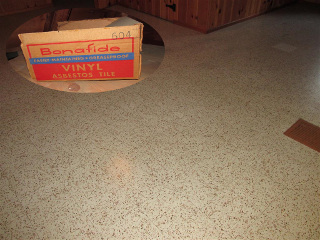 Never abrade the surface of a vinyl asbestos tile. Never clean it with steel wool or sand it for any reason as this will release the fibers into the air. Cleaning it with vinyl floor cleaners is fine and is the preferred method of cleaning. Be careful even scraping the surface of the tiles. So if you do have vinyl asbestos tile in your home there really shouldn't be a health risk. When the time comes to install a new floor in the room containing vinyl asbestos tile there are many options. Most companies, when they find that vinyl asbestos tiles are present on the job, will refuse to do the job until the tiles are removed. This has to do with the liabilities associated with vinyl asbestos tiles. But this is an overblown reaction to the situation. New flooring can be safely installed over vinyl asbestos tiles without any health risks whatsoever. One option is to remove the asbestos tiles. This can be a very expensive proposition when employing a certified asbestos removal company or using a contractor that is asbestos certified. Another option is just to go over the existing asbestos flooring. If the tile is installed on a concrete floor, such as you would find in a basement, you would just need to skim coat the surface of the asbestos tile. There are products out there designed to be applied to the surface of the asbestos tile that will allow another floor to be glued down on top. Covering the old asbestos tile is a safe and entirely satisfactory solution. If you have asbestos tile on top of a wood substrate such as plywood, OSB or any other suitable base layer then you can install a layer of luan over the top and then the new flooring thereby sealing in the asbestos tile underneath. The old tile needn't be removed. 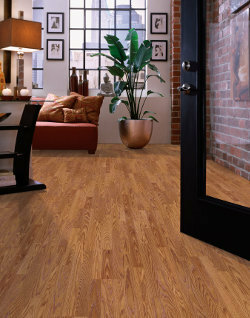 Laminate flooring is a hard surface flooring that has a lot of uses. You can use it in kitchens, laundry rooms, entry ways, living rooms......really any room in the house (maybe better not in full bathrooms, too much water potential). It has a very hard surface with a melamine wear layer. Very scratch resistant and dent resistant. You can scratch a laminate flooring surface if you try hard enough (don't try this at home....lol). You can hit the floor with a hammer and not leave a mark. Whereas hardwood flooring will scratch and dent. Try hitting a hardwood floor with a hammer and see the results. Walk inside from the outside on a hardwood floor and see how the floor will in time start showing lots of scratches and wear and tear. A laminate floor will hold up better to this type of abuse than hardwood flooring. Laminate floors have come a long way when it comes to water resistance. In the old days (maybe 20 years ago) laminate floors were very susceptible to moisture. Now most laminate floors are treated for water resistance and will stand up to water (a flood, a water leak under the sink or a washer overload will put enough water on and under the floor that you will probably still get swelling and cupping that will ruin the floor). Water resistant but not water proof, remember that. Laminates are marketed for the DIY market. Most people that are handy can install this type of floor which can save you money. Professional installation is still the best way to go but you can still install this floor yourself. Unlike vinyl flooring or ceramic tile which are much harder for the do-it-yourselfer to do. The visuals in laminate flooring have improved over the years also. They have a very lifelike look to them these days. Some of the older laminate styles looked unreal. They looked fake. Not so some of the newer styles. They look real and you can hardly tell some of them from the real thing. Laminates have a niche in the flooring industry these days and can be a great addition to any home.